Reduce. Reuse. Recycle. We see those buzz words everywhere but how often do we consider how to implement them into our lives? Recycle is easy thanks to Baltimore City transitioning to single stream recycling each week. Sheila, you and I may not have agreed on much while you were Mayor but I would personally like to thank you for expanding the recycling program. There are also great local resources like Free Store and Book Thing for other forms of recycling. And even though I know I probably consume just as much as the next person, I’m hard pressed to find ways to reduce. Although if you asked The Mistah, he’d say to start with the growing collection of purses and shoes that are taking over our limited closet space. Ok, so reduce continues to be a struggle. But reuse, that’s just the flip side of recycle. What gets recycled by me today can get reused by someone else tomorrow. Like that copper pan up there. That tarnished beauty was hiding on a dusty back shelf in a Goodwill store. After a good cleaning with Bar Keepers Friend, it was gleaming and bright. All for less than $2. So yes, it really does pay to be thrifty. And tell the Mistah bag and shoe criticism is off limits. Those things, like camera equipment, are sacred. Beth, The Mistah and I definitely have different ideas about that which is sacred. 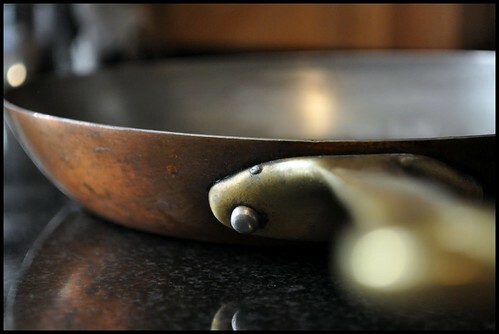 I had that skillet retinned and professionally polished so that I could actually use it for cooking. It is a beauty indeed. Great idea! My friend Stel is a big consignment shop shopper, and I’ve liked the idea of that. I’m not much of a shopper at all unless I’m going to the bookstore or Target, but I really should tag along with her sometime. And I was lugging my recycling up to my parents’ house before those yellow got passed around. I was so glad to see those bins!